As more and more innovations are made in veterinary medicine, we have more and more medical interventions available to treat your pet. Pets can receive sophisticated oncology treatments, cutting edge orthopedics, and even CT scans, the scope of which would have been inconceivable thirty years ago. These interventions have changed the way we practice veterinary medicine, but they can also be expensive. Unfortunately, we are more often limited by financial concerns than because we have run out of treatments that can benefit a pet. We encourage all of our clients to consider health insurance for their pet. We would always prefer our clients make a medical decision rather than a financial one. 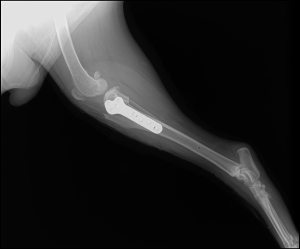 TPLO is a surgery to correct lameness resulting from a ruptured ligament. Many of the major insurance carriers are offering pet insurance as an add-on to their automotive policies, and many large employers are beginning to offer pet policies as an employee benefit. The major rescue organizations here in North Texas typically offer a 30 day free insurance policy on their pet adoptions (and should definitely take advantage of that), and your veterinarian can give you some insight about the policies used by clients in their practice. We recommend Trupanion in our practice, mostly due to the flexibility in setting deductibles that fit your budget, but we are less concerned about who the carrier is and more concerned that our clients and patients have coverage that allows our patients to receive the best medicine.